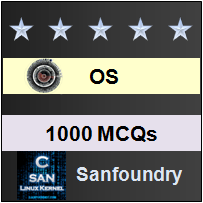 This set of Operating System Multiple Choice Questions & Answers (MCQs) focuses on “Semaphores”. 7. The wait operation of the semaphore basically works on the basic _______ system call. 8. The signal operation of the semaphore basically works on the basic _______ system call. 11. The following program consists of 3 concurrent processes and 3 binary semaphores. The semaphores are initialized as S0 = 1, S1 = 0, S2 = 0. How many times will P0 print ‘0’ ? The code for P10 is identical except that it uses V(mutex) instead of P(mutex). What is the largest number of processes that can be inside the critical section at any moment (the mutex being initialized to 1)? Explanation: Any one of the 9 processes can get into critical section after executing P(mutex) which decrements the mutex value to 0. At this time P10 can enter critical section by incrementing the value to 1. Now any of the 9 processes can enter the critical section by again decrementing the mutex value to 0. None of the remaining processes can get into their critical sections. Here, w1 and w2 are shared variables, which are initialized to false. Which one of the following statements is TRUE about the above construct?